Google goes after Microsoft’s Surface Pro and Apple’s iPad Pro with its new premium Samsung Chromebook Pro and Plus laptop-tablet hybrids. It’s a laptop! It’s a tablet! It has a stylus! You can fold it backwards! You can draw on it! The Samsung Chromebook Pro and Plus aren’t your kid brother’s classroom Chromebooks. Google is adding new premium options to its low-cost laptop line: two Samsung-branded hybrid computer-tablets (what gadget p33ps call “convertibles”) with styluses built-in. The devices are clearly aimed at customers who are interested in Microsoft's Surface Pro (between $699 and $1,049) or Apple's iPad Pro tablets ($599–$929), but who aren’t keen on those products’ hefty price tags. The Chromebook Pro is now Google’s most high-end Chromebook offering — and it costs just $549, while the Chromebook Plus is priced at $449. What’s unique about the devices aren’t just that they’re ~fancier~ than Chromebooks past – it’s that the laptops can run Android apps for phones and tablets. All of them. Google is hoping that opening its Chromebooks to the over 2 million touchscreen-friendly games and mobile apps available in its Play Store will give its lightweight laptops even more of an edge over other devices. I’ve been letting my MacBook Air collect dust for two weeks while testing out a preproduction version of the new Chromebook Pro, the faster and more powerful of the two. It's available at the end of April with no specific release date set. I found the Pro to be impressively versatile. It was sufficient at most of my work computer tasks (namely messaging my boss, writing reviews like this one, and reading articles). The other bells and whistles, like the stylus and touchscreen, were nonessential, but worked well when I needed them. What the hell is a Chromebook? Who should consider buying one? If you’re already familiar, just jump to the next section. Chromebooks are breathtakingly cheap computers. I once bought two mascaras and a foundation at Sephora and it was more expensive than the cheapest Chromebook you can get at Best Buy. But you get what you pay for. They’re simple machines that can handle a lot of things, like responding to email, scrolling through Facebook, watching YouTube videos, streaming Netflix, word processing, and reading articles. Chromebooks need a strong Wi-Fi connection, and, while you can still use Google Docs, watch some Netflix shows, and listen to Spotify offline, there isn’t a ton of functionality for people who don’t have access to reliable internet. Chromebooks are the conceptual opposite of Android phones, which have, historically, been more appealing to tinkerers and gadget geeks. Chromebooks, on the other hand, are grab-and-go machines designed for people who know how to surf the web, but don’t consider themselves techies. The laptops are dead simple. To start using one, all you need is a Google account. The devices are less susceptible to malware than others, and benefit from automatic security updates every six weeks. They’re a good fit for a lot of people. Chromebooks outsold Macs for the first time in 2016, with over half of that market going to the education sector. Over 20 million students now use Chromebooks in classrooms worldwide. Processors typically aren’t very good in Chromebooks. Gamers and extreme multitaskers will find that the computers become slow and unusable under a heavy load. People who prefer to optimize their digital workspace with apps like F.lux and BetterSnapTool might find the cookie-cutter Chrome environment too limiting. Lastly, and most importantly, Chromebooks can’t do most photo and video editing. You can do lightweight stuff (adjust brightness, draw on photos, add filters, etc.) but Chromebooks can’t run Photoshop CC or Premiere CC. There’s a stylus tucked away in the side, and it’s not horrible. It’s technically called a “digitizer pen,” because it doesn’t require charging. 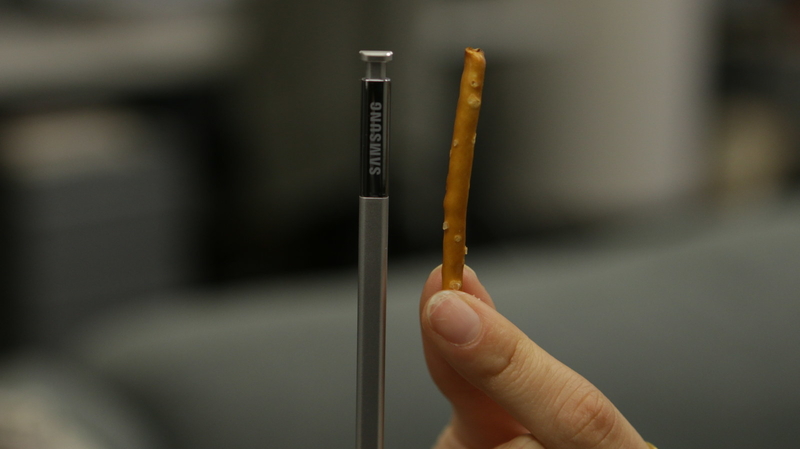 Samsung calls the stylus in its Galaxy Note the same thing. The pen looks the same, feels the same, and clicks in its storage dock in the same way as the exploding Note 7’s stylus did. Nevertheless, the pen is great at highlighting PDFs, taking quick screenshots, and doodling, but not so great at writing essays. While it can keep up with bigger, broader strokes, there's too much lag to make your handwriting feel authentic. The pen takes advantage of a new algorithm Google developed that predicts where your hand is going. This reduces the lag between the stroke and what shows up on screen. Right now, the prediction model is only available in Google Keep, a to-do list and note taking app, but the team is providing the stylus API to both web apps and Android apps. Google Keep can also sort of recognize your handwriting, so you can search for your notes (as long as you have decent "digitizer pen-"menship). For serious note-takers considering the Chromebook Pro as a notebook replacement, I will say that the pen doesn't compare to the Apple Pencil's true-to-real-life-writing, with the Microsoft’s Surface Pen on Surface Book being a close second. But, again, those are much more expensive devices built for power users. Furthermore, the stylus is the ittybittiesttiniest writing utensil. It’s no bigger than a pretzel stick, so I wouldn’t recommend using it for extended periods of time, unless you want to give yourself a hand cramp. Here's what writing is like on the iPad Pro. Here's what writing is like on Microsoft's SurfaceBook. The Pro is faster, more lightweight, and more versatile than other Chromebooks I’ve tried. What’s inside of this laptop is pretty impressive. There’s 4GB of memory, which I found is powerful enough for most people with Too Many Tabs Open-itis, though the processor starts to slow down when there's a graphics-intensive game running. There’s an accelerometer and gyroscope built-in too, which are common in phones but not necessarily computers, so you can play games that require tilt-to-steer or other gestures. The laptop includes two USB-C ports, both of which can charge the device and support 4k displays. It comes with 32GB of hard drive storage, which isn’t a lot, but every new Chromebook user gets 100GB of Google Drive storage free for two years, and there’s a media card reader slot for storing big media, like high-resolution videos, on a MicroSD card. The battery isn’t as good as the Dell Chromebook 13, which boasts 11 hours, but it did last me between 6 and 7 hours with heavy use. It feels and looks nicer than others too. The Pro has an all-metal body, with smooth, curved edges. The 12.3-inch screen feels nice and roomy. It has a surprisingly beautiful 2,400 x 1,600 pixel LED touch display, which is slightly higher resolution than the Microsoft Surface Pro 3 (not the newest Surface, but the same price point). It’s super portable, too, at only 2.38 pounds (just a tad lighter than the 11-inch MacBook Air) and about half an inch thin. The model I tested was silver but when they launch, the Chromebook Pro will be available in black, which is much more badass IMO. 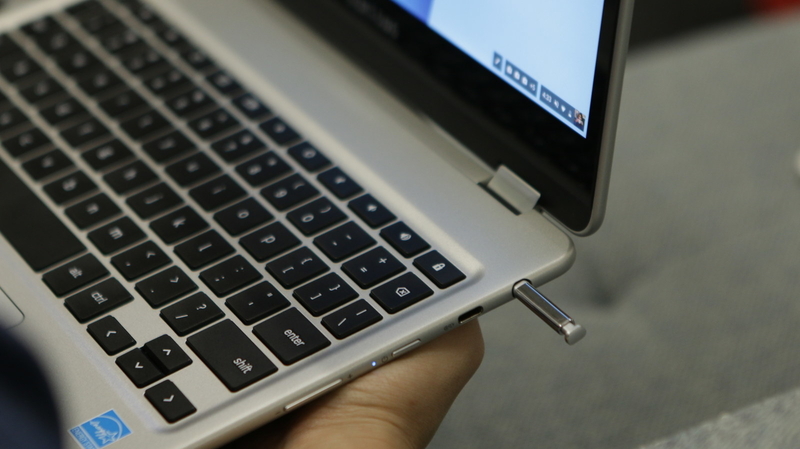 The keyboard is really bouncy and comfortable – but has the quirks of a Chromebook. The curved keys click and clack satisfyingly, the way you’d expect a traditional keyboard to. It’s comfortable enough to type on for hours on end (which I know because I wrote this whole review on it). But if you’re switching to a Chromebook for the first time, you’ll notice quirks, like the lack of caps lock key (it’s “alt + the magnifying glass “search” icon” instead). Special characters are hidden behind special codes as well. An em dash, for instance is shift-ctrl+u+2014. The native Android app experience was hit or miss. Gaming on the Chromebook Pro was...interesting. I tried a racing game called Asphalt 8 that requires tilting for steering and tapping your thumbs for braking or accelerating. The screen displayed the graphics beautifully, but the gaming experience felt awkward. The display folds back in tablet mode and can’t be detached from the keyboard, so I was constantly pressing keys accidentally while trying to keep my grip on the screen. My palm would occasionally touch the bottom dock, and I switched apps multiple times during gameplay. After about a minute in, the game started skipping frames. It was a load too heavy for the computer's processor. For more casual games, with the laptop in tablet mode, I had the device resting on my knees and found the keyboard bottom a bit unstable. Some Android apps ran perfectly fine. Spotify and Netflix were great, because I could download music and shows offline. PDF Max, which I used to highlight PDFs and scribble notes, also worked flawlessly. Other apps, however, offer a much better web versus native experience. The Android version of the messaging platform Slack was much slower than its browser counterpart. The text also appeared super small with no option to adjust it. When Chromebooks update to Android N (by the end of April, when the Pro ships), you’ll be able to do much more with the apps, like actually adjust window size (now there are only two options: small or full screen). Ultimately, the Chromebook Pro is an ideal machine for people who don’t need a full desktop experience, but want something more substantial than a tablet. The stylus isn’t an essential part of the Chromebook Pro experience, but when it’s paired with the HD movie-worthy touchscreen, they make the device the most versatile Chromebook ever. But if you don't need a touchscreen, a stylus, or mobile-friendly sensors like the accelerometer or gyro, don't get this Chromebook. The Android integration isn't quite there yet, and there are plenty of other fantastic, equally powerful, and even more affordable Chromebooks on the market. There are few differences between the Pro and Plus models. The Pro comes in black, and the Plus doesn’t. The Plus is $100 cheaper, and goes on sale this Sunday for $449, while the Pro will arrive at the end of April for $549. The reason for that price disparity is the processor powering the laptops. The Pro has an Intel core m3 (the same in Apple’s MacBook) and the Plus runs on an OP1, a hexa-core chip designed specifically for Chromebook. I’d strongly recommend the Pro, especially if multitasking and streaming are part of your workflow. If you’re just a web browser and occasional typist, the Plus should be fine. Both machines have 4GB of memory, which is what most people need. The bottom line is: The Chromebook Pro is a good-looking, portable laptop that can do most things you want to do on a laptop. But keep in mind: Although the Chromebook Pro has more functionality now that it supports Android apps, it’s at its best when it’s running the browser it’s named after.